The 2014 Winter Olympics are upon us! With Opening Ceremonies on Friday night, audiences across the world are getting pumped for their favorite events. Now, we've already covered the new competitions this Games, but there are so many other factors affecting the sixteen-day period full of sports that we wanted to take a closer look at some of the potential differences in watching the Olympics this time around. NBC will be providing America with its coverage again this time around, which many have been voicing concerns over for the past 18 months, ever since the US had to wait hours to see how Michael Phelps won the Gold that everyone reported he did. 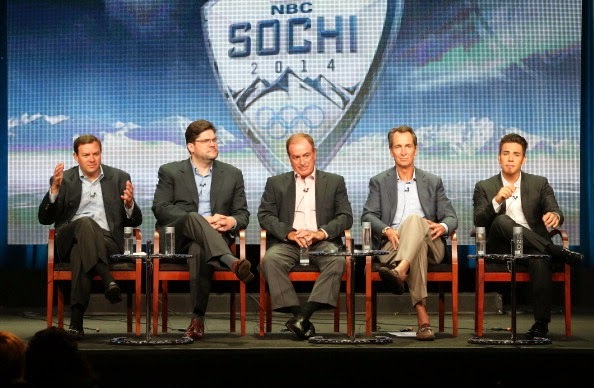 Last summer, at the TCA press tour, NBC Sports had a panel for their Sochi 2014 coverage, featuring Chairman of NBC Sports Group Mark Lazarus, Executive Producer Jim Bell, and NBC Olympics reporters Al Michaels, Cris Collinsworth, and Apolo Ohno. During this time, Bell talked about the time-delay in a positive way, noting that NBC always wants to provide coverage at a time when most people can watch. So, although many Americans would be unable to watch live competitions because of their work schedules, those who have more flexibility will continue to need to turn to the internet and NBC's app or online viewing for live looks at the sports. NBC will also continue to include the human interest stories woven into their nightly primetime coverage, as Bell mentioned that most viewers don’t know about the athletes, so it’s important to connect with them. And, speaking of connection, when asked if there were special challenges in dealing with Russia to cover the Olympics, Bell responded that every country has its share of challenges and language barriers, but there are no more special challenges than other countries. Now, five months later, he might have a little more to say, given what has been surfacing about journalism in Sochi these days. Ohno should make an excellent field reporter as he still gets goosebumps seeing athletes, knowing what they've gone through, and is very very excited for the opportunity to bring that passion and enthusiasm to the world." Ohno is expected to cover short track, his signature event, as well as other sports in the Games.